In the immediate neighborhood of the hotel, reachable also on foot, is the Leonardo Da Vinci Museum and only 3km away is the Birth House of Leonardo. A few kilometers away you will find the Stadium Carlo Castellani di Empoli and the Monteboro sport center. 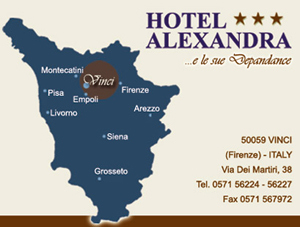 Hotel Alexandra is in an ideal position to reach all the main turistic locations and cultural sights - Florence (about 30km), Siena (about 60km), Lucca (about 40km), Pisa (about 50km), San Gimignano, and Volterra.